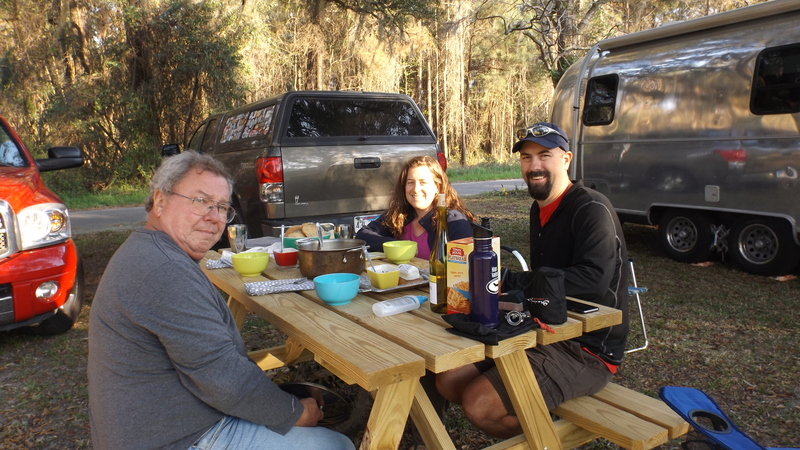 Yesterday we visited a Road Food 5-star café in Charleston, Dave’s Carry-Out. 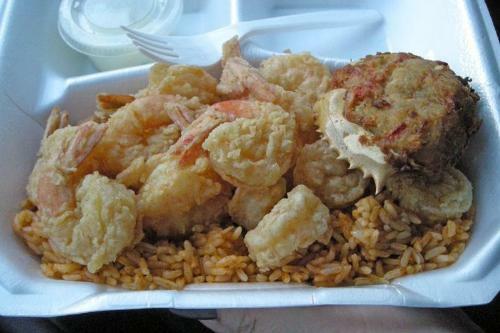 I ordered Michael Stern’s favorite menu item, the Shrimp Box with a side of stuffed crab. Dave was out of stuffed crab, but the shrimp were as good and plentiful as reviewed. I am curious about most things food, and South Carolina’s red rice was on the menu. It was my side with the shrimp. Red rice turned out to be jambalaya without meat. Good, for sure, but maybe not worth 40 words. Terry (Dave’s son, who now operates the joint) was fashionably late, and since he and he alone batters and fries the shrimp, his help didn’t open the door until he strolled up, swingin’ them arms behind, wishing everybody a hearty “Good afternoon”. It was only 11:45, but what the hey! No trip to South Carolina is complete without a plate of Shrimp ‘n Grits. Rather than drop $50 into Hominy Grill’s kitty, Kat ‘n I put together our own. 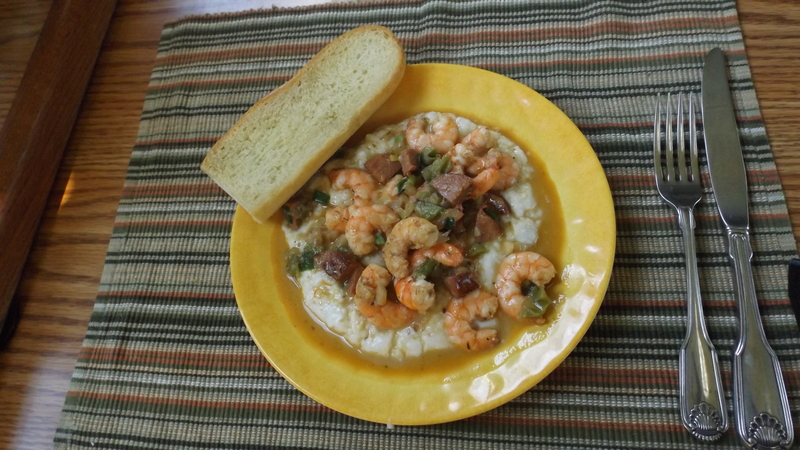 Using Emeril’s recipe for “Spicy Shrimp & Andouille Over Charleston Grits” we knocked dem shrimps out of the park. That dish might be better than the fresh clam linguine, but don’t hold me to that. Each is what the late, great Richard Collin would grade as “A Platonic Dish”. No-see-ums got in and ate me up beneath the sheets last night. Kat awakened unscathed. As with grizzlies, one need not be the fastest to escape; it is key to not be the slowest. When it comes to blood-thirsty bugs, I’m always the slowest guy in the room. There, with apologies to K. C. & the Sunshine Band (I’m Your Boogie Man) came my low country name. Here it is, for your listening pleasure. The title project is Kat’s effort to repay that nameless stranger who paid our bridge toll ahead of us in Pensacola. It was only a buck, but still quite the surprise. She wants to raise a thousand bucks for an animal shelter in the town we often visit for Christmas. And it won’t cost you a cent. Just vote for her idea at What Fuels Me. There’s a link to it here. They may want you to log in on Facebook, but that’s a small price to pay. You can and should vote once a day every day until April 8. The top ten vote getters get a check for $1,000, but she’ll likely need several hundred votes to win one. After about 30 hours her project had 30 votes. Anybody with so few friends should carry a gun. They are fun people, and genuine. But you read us long before they did … we’re up for cooking our potato soup for you anytime, Em. It was awesome to meet you both! Sounds like you took advantage of the local cuisine much more than we we did during our short visit. Happy travels and I hope we cross paths again someday. I love to cook, Amanda, and cajun cooking is one of my sugar sticks (Google it!). SEAFOOD forty years ago was cheaper than hamburger, and in McClellanville it still is. Ain’t no way we can not gobble all of it we can while it’s there. 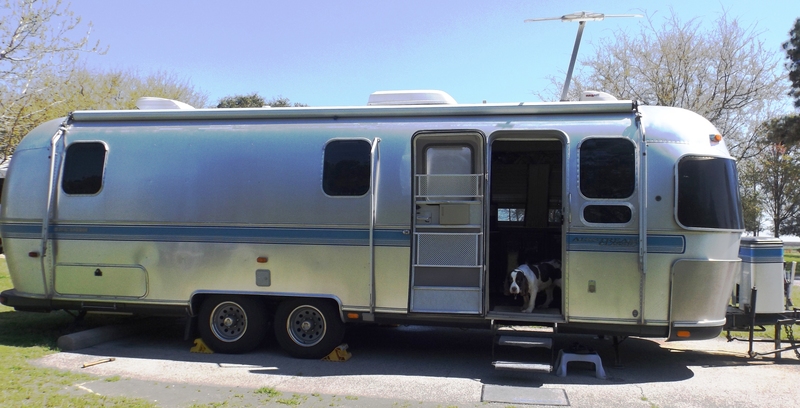 Thanks for inviting us over; love your chow and rig. ‘Twas great meeting you and Tim, and yes, may our paths cross again.